Leverage, the great accelerator on the way up and on the way down. 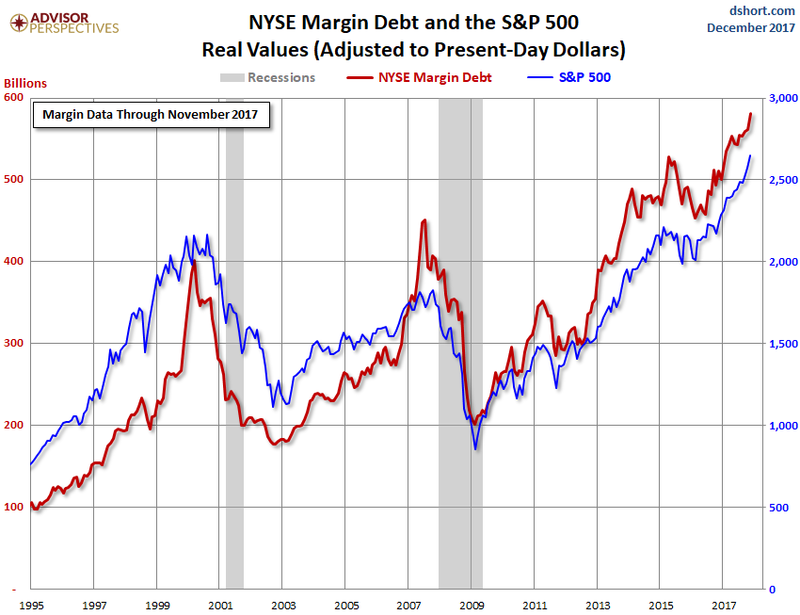 Margin debt is the embodiment of stock market risk. As reported by the New York Stock Exchange today, it jumped 3.5%, or $19.5 billion, in November from October, to a new record of $580.9 billion. After having jumped from one record to the next, it is now up 16% from a year ago. 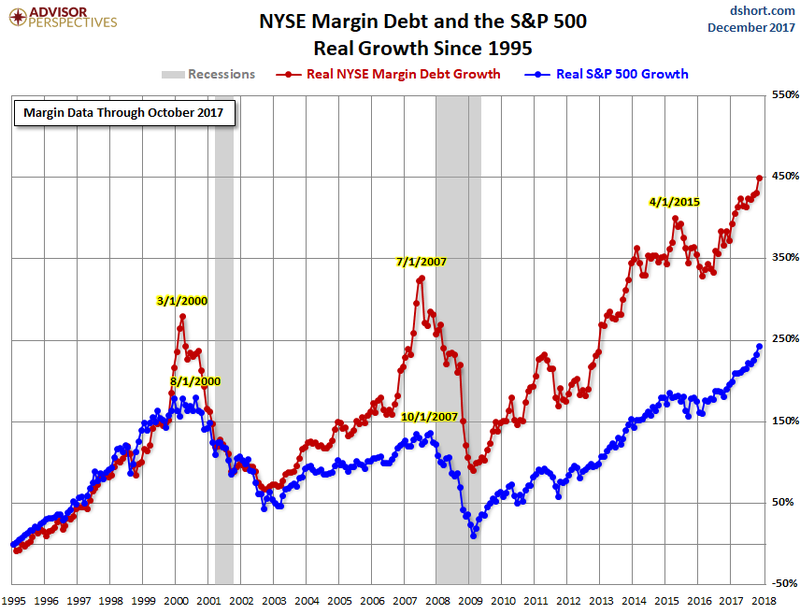 Margin debt, which forms part of overall stock market leverage, is the great accelerator for stocks, on the way up and on the way down. Rising margin debt – when investors borrow against their portfolios – creates liquidity out of nothing, and much of this new liquidity is used to buy more stocks. But falling margin debt returns this liquidity to where it came from. Leverage supplies liquidity. But it isn’t liquidity that moves from one asset to another. It is liquidity that is being created to be plowed into stocks, and that can evaporate just as quickly: When stocks are dumped to pay down margin debt, the money from those stock sales doesn’t go into other stocks or another asset class, doesn’t become cash “sitting on the sidelines,” as the industry likes to say, and isn’t used to buy gold or cryptocurrencies or whatever. It just evaporates without a trace. “In the event of a sell-off, high levels of margin debt can encourage additional selling, which could, in turn, lead to a more rapid tightening of financial conditions,” he mused. In other words, the stock market is far more leveraged than it has ever been before. Stock-market leverage, however, is broader than just margin debt. Stocks can be leveraged in many ways. Larger players, such as hedge funds, can borrow at the institutional level to fund stock purchases. Stock market leverage includes so-called securities-based loans (SBLs), offered by financial firms to their clients. These loans can be used to buy anything, not just stocks. But like margin debt, there are margin requirements, and when stocks fall, margin calls and forced selling set in to pay down the debt, which accelerates the rout. SBLs are called “shadow margin” because they’re not reported in an overall manner and no one knows the overall magnitude. But occasionally, the risks they pose – though they’re considered low-risk – come to the foreground in a most spectacular manner. This happened when the bankers of Christo Wiese — the former chairman and largest shareholder of Steinhoff International Holdings — suddenly discovered that almost all of their collateral for a €1.6-billion SBL they’d made to him had evaporated as the €3.2 billion in Steinhoff shares he’d pledged had gotten totally crushed, essentially to nothing. Now the banks are licking their wounds.